Spill containment is a very important component of safety in the workplace. Having the necessary equipment on hand to quickly contain a spill and keep it from spreading helps ensure safety for employees and visitors, as well as the environment. There are two levels of spill containment. Spill containment refers to the steps taken to stop the spread of a spill after any immediate safety issues have been taken care of. Making sure the spill doesn’t spread to a larger area is a priority. Not only will containing the spill to a smaller area mean fewer people and less area are affected but it will make it quicker to get cleaned up. Ideally, your facility will have some measures already in place in anticipation of possible spills like drain guards that remove oil and grease from water or making sure you have an appropriate sized spill kit in close proximity. 5 gallon spill kits might be perfect for a truck driver because they fit easily into the cab of the truck. 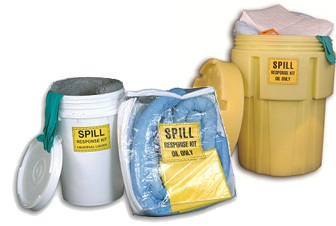 62 gallon spill kits are designed for larger spills with DOT approved overpack that can also be used as temporary storage for transportation to a disposal site. Drums and totes are often used as primary containers. These are the containers that store the liquid to be disposed of. However, in some instances where hazardous materials are involved secondary containment is necessary because the primary containers might fail. The secondary container must be have enough volume available to hold the entire contents of the primary container should the first leak. The base must be intact and free from cracks or leaks.